CAPE CANAVERAL, Florida -- The Taurid meteor shower peaks overnight tonight and into the early morning of November 12, 2015. This year's meteor shower is expected to produce an above average amount of fireball meteors streaking through the night sky. The Taurids may be more active than usual this year, according to Bill Cooke, lead for the NASA Meteoroid Environments Office. Known as the Taurid “swarm,” these bright meteors are created when the Earth runs into a group of pebble-sized fragments from the comet that then burn up in the atmosphere. Given the behavior of past Taurid swarms, increased fireball activity may be seen during the first two weeks of November. Every year from September-November, the Earth passes through a broad stream of debris left by Comet 2/P Encke. The dust associated with the comet hits the Earth’s atmosphere at 65,000 mph and burns up, creating the Taurid meteor shower. During most years, the shower is weak, and only a few Taurid meteors can be seen each night. 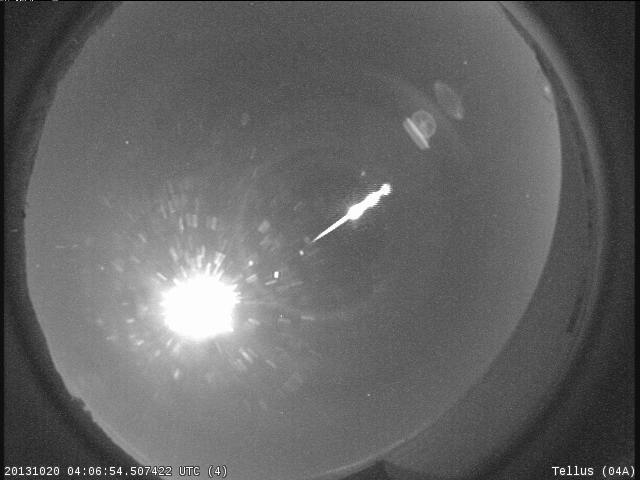 Other years, the Taurids can put on a show and produce huge fireballs. For optimal viewing, find an open sky, lie on the ground, and look straight up into the dark sky. It is important to be far away from artificial lights. Your eyes can take up to 30 minutes to adjust to the darkness, so allow plenty of time for your eyes to dark-adapt. Taurid meteors can be seen any time the constellation Taurus is above the horizon during the months of September, October, and November. The best time to look for Taurids is after midnight, when Taurus is high in the sky, and when the sky is dark and clear, with no moonlight or twilight to mask the fainter meteors. First, find Orion's noticeable three-star belt in the night sky. 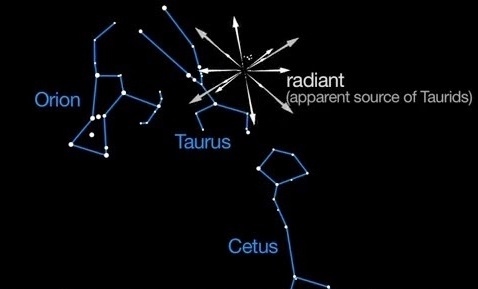 Then look slightly to the west to find the Taurus constellation and the radiant of the Taurid meteor shower where the meteors appear to originate.